A San Diego woman who touts her connections to former Gov. Arnold Schwarzenegger and billionaire philanthropist T. Denny Sanford to promote her after-school programs sold the San Ysidro School District a sports and cheer package that never happened. And two years later, the district is still trying to recoup the $276,000 it paid upfront. Tyree Dillingham promised that her Greater San Diego After-School All-Stars would provide a yearlong sports and cheer program for more than 1,600 of San Ysidro’s students. The program was important for a district that serves some of the poorest students in the county. While investigating questions about the after-school contract, inewsource discovered questionable claims Dillingham used in promoting her business online and in Arizona. Some of these claims have since been erased from her website. In one instance, Dillingham appeared in a photo with Sanford, who lives in La Jolla and made his fortune in credit and banking. He is holding a $28 million check that appeared to be made out to her company. A spokeswoman for Sanford told inewsource the philanthropist gave $500,000 to Dillingham’s company — not $28 million. The check in the photo with Dillingham and Sanford is dated April 18, 2017, the same day he was photographed giving a $28 million check to the National University System. 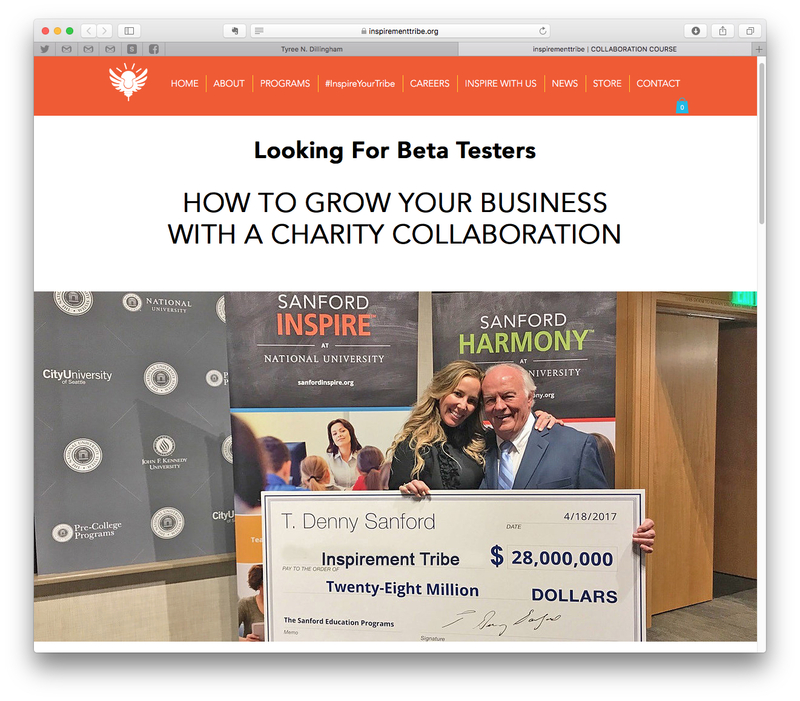 A screenshot is shown (left) of T. Denny Sanford giving a $28 million check to the National University System on April 18, 2017, the same day he is shown holding a $28 million check with Tyree Dillingham, CEO of Inspirement Tribe (right). Dillingham’s Facebook page for her business has been taken down since inewsource began asking about the San Ysidro contract. The photo of the $28 million check also has been removed from her company’s website. Repeated attempts by inewsource to speak to Dillingham, including phone calls, emails and visits to her home, failed, although a friend who said he was representing her said Dillingham tried twice to refund money to the San Ysidro School District. The district could not immediately confirm those attempts, and Superintendent Gina Potter, who was hired in April, told inewsource in an Oct. 5 email that the district’s lawyer has now reached out to Dillingham’s company for reimbursement. In January 2010, Dillingham became executive director of the Greater San Diego After-School All-Stars nonprofit. The company began in 1995 as a chapter of a national after-school sports program founded by Schwarzenegger. Dillingham, who last year changed the local All-Stars’ name to Inspirement Tribe, boasted on the program’s website that she was Schwarzenegger’s “right-hand woman for 14 years.” She worked in Schwarzenegger’s San Diego office from January 2004 to December 2009, when he was governor, according to her LinkedIn. A director with the national After-School All-Stars told inewsource that Dillingham ran an independent nonprofit and paid for a licensing agreement to use the All-Stars name. That agreement has since ended, the director said. Dillingham said in an online video she rebranded the organization as Inspirement Tribe because she saw a need for social and emotional learning. Five months after she made that change, the Internal Revenue Service revoked the group’s nonprofit status for failing to file tax documents for three consecutive years. Nonprofits are required by law to make their tax returns public so donors and others can review their finances. As of Oct. 8, the most recently available data, Inspirement Tribe was still not operating as a nonprofit, meaning it’s now required to pay income taxes on revenue, including donations. Donors also can’t deduct contributions made to the organization. 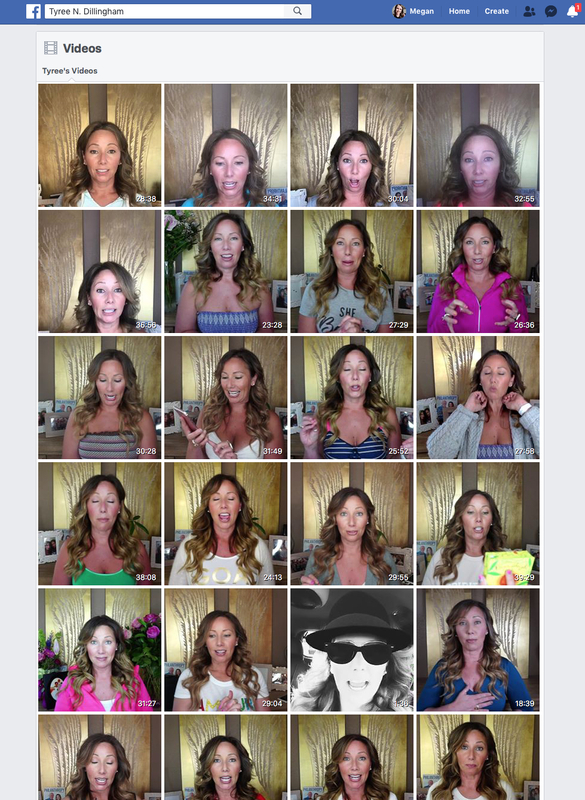 Over the past nine months, Dillingham has posted weekly “Lunch and Learn” live videos on her Facebook page giving motivational talks. She also has appeared in videos on other people’s Facebook pages describing her after-school program. “We provide inner-city and homeless youth with free after-school and out-of-school-time programming that’s based in social and emotional learning,” Dillingham said in a video this past April. In a video posted last year, she promoted her fundraising skills. A webinar promoted online by the nonprofit Arizona Center for Afterschool Excellence shows Dillingham solicited middle schools in Maricopa County to participate in her program. inewsource was unable to verify if any programs began in the state. Courtney Sullivan, the center’s executive director, said she helped Inspirement Tribe connect with school districts until she learned the program that Dillingham was marketing had not yet been developed. Before Dillingham got her contract with the San Ysidro School District, she had made nearly $1.7 million providing programs at two other San Diego County school districts. 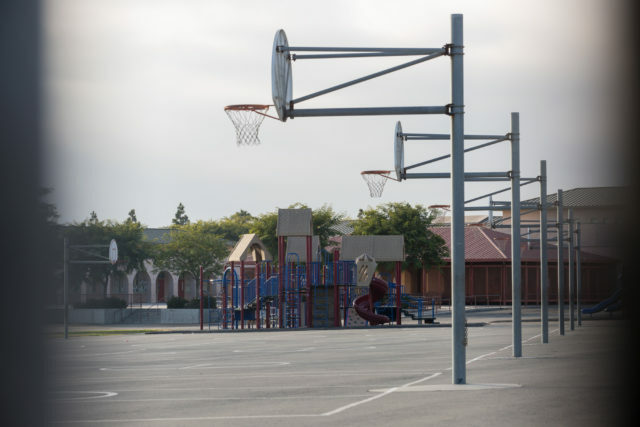 The Sweetwater Union School District paid her All-Stars nonprofit about $1.1 million for after-school and bullying prevention programs from 2010 to 2012. The San Diego Unified School District paid the nonprofit about $590,000 for after-school programs from 2011 to 2015. Officials for both districts said they no longer contract with Dillingham’s All-Stars but could not say why. Dillingham was introduced to the San Ysidro school board in 2015 when her All-Stars group competed with four other nonprofits for the district’s $950,600 after-school program. The Boys and Girls Club of South County won the contract. The next year, the school board gave Dillingham’s company a $425,000 contract for the after-school sports program. For the 2016-17 school year, Dillingham was to provide coaching, uniforms and oversight for three sports leagues, a cheer program, a football camp named after former NFL player Reggie Bush and a baseball clinic named after former major leaguer Tony Clark. Bush and Clark grew up in San Diego County. The “professional services agreement” with Dillingham did not have be put out to bid, district officials said. County education officials confirmed this is allowed. 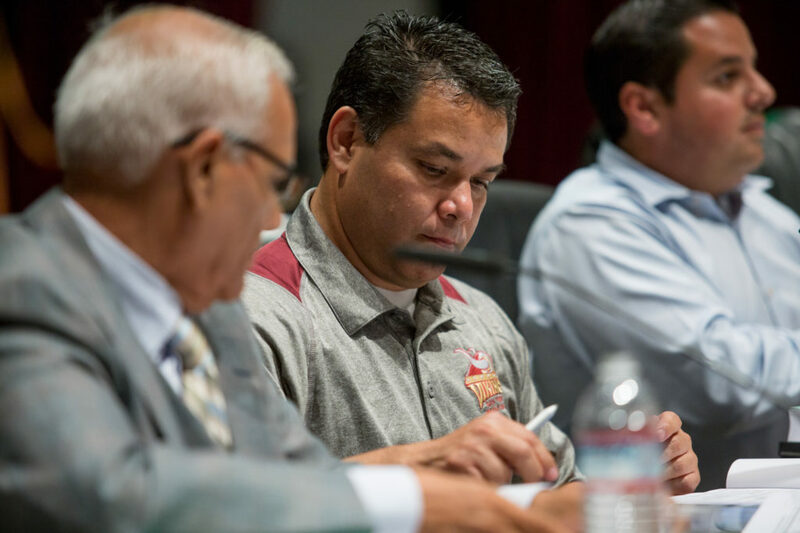 Then-Superintendent Julio Fonseca recommended the school board approve the contract, which the members did unanimously as part of a consent calendar. The agreement required the district pay Dillingham’s nonprofit $276,000 within 30 days of the approval — or 65 percent of the contract’s total amount. The district’s check was issued on Aug. 15, more than three weeks before any after-school activities were to begin. In an email obtained by inewsource, Dillingham told Alexis Rodriguez, the after-school program coordinator at the time, that the district would be sent a schedule of games on Sept. 9. The nonprofit first had to hire and train coaches, enroll students, and communicate with school staff, Dillingham said. 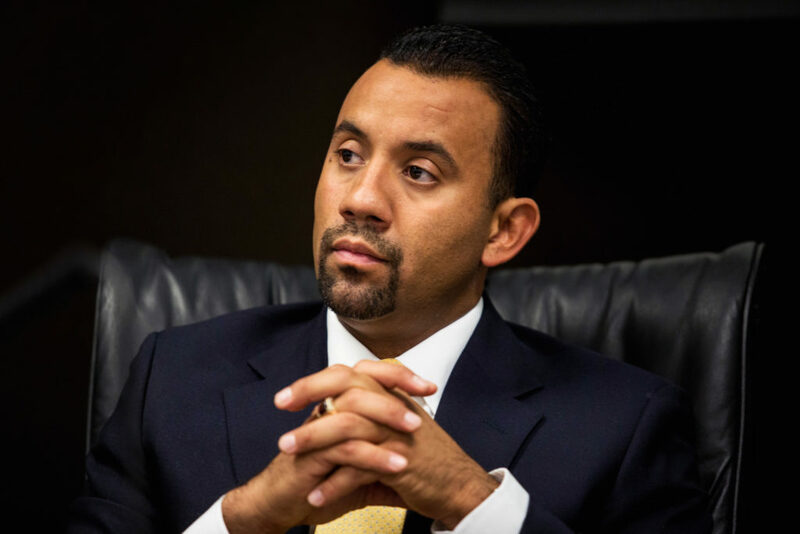 On Oct. 4, Rodriguez emailed Jose Arturo Sanchez-Macias, the district’s deputy superintendent in 2016, a draft email she said she wanted to send Dillingham but never did, according to a public records request. The district has “had zero success” with getting the All-Stars program started, she said. Sanchez-Macias recently told inewsource he found aspects of the “contract were rather strange,” including the large upfront payment, but he agreed to pay it. Sanchez-Macias said when he realized the program was not going to happen, he took steps to try to get Dillingham and her nonprofit to refund the $276,000, including threatening litigation. Those efforts failed, he said. inewsource showed Sanchez-Macias the letter Dillingham said she sent the school district in 2016 trying to return the money. He said he had never seen it. Fonseca and Sanchez-Macias resigned last year amid questions about their compensation packages and other possible financial misdeeds. Those issues led to an “extraordinary audit” by the state that concluded the two administrators engaged in possible financial fraud and misuse of district funds. Sanchez-Macias and Fonseca’s lawyer have disputed the audit’s findings. Fonseca’s lawyer did not respond to requests for comment on this story. State authorities also are conducting a second audit into the district’s contract agreements. A state official said the auditors were aware of Dillingham’s contract with the district, but it is not currently part of the state investigation. District officials declined interview requests from inewsource about Dillingham’s after-school program and said they could not verify her claims that she tried to refund money to the district in 2016 or more recently. Under the terms of Dillingham’s contract, she was to be reimbursed only for services she had provided, though the agreement did not mention refunding any part of the upfront payment to the All-Stars. Board member Diaz told inewsource Oct. 11 that in the past two weeks, the district has “finally gotten some response” from Dillingham’s company. He said the district was promised a service that was not delivered, but said the administration and board members are partly to blame. If the administration had trained and educated the board better about this contract, these problems would have been avoided, he said. Since the district hired Superintendent Potter in April, Diaz said the school board now receives more detailed information about board items, calling the process like “night and day” compared to what trustees received in the past. Diaz said he also would never again approve a contract requiring 65 percent payment upfront.